Now that we have decided what we want our surround to look like we need to frame in the fireplace. 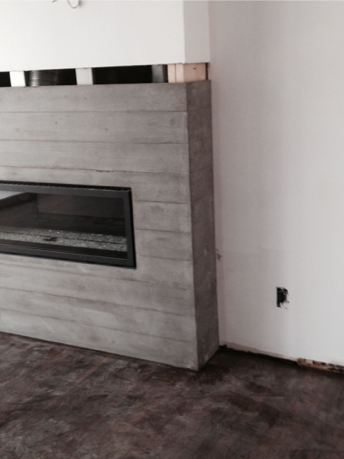 For this space we chose a modern, horizontal gas burning fireplace. 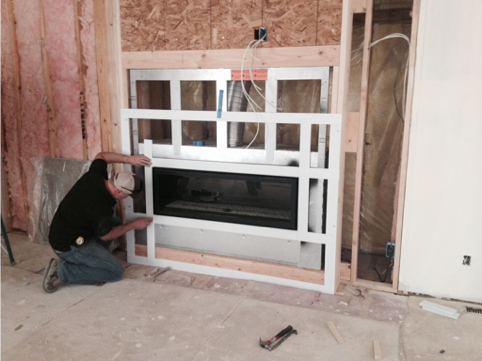 When building the framing we always kept in mind the manufacturers specs of minimum distance to combustibles as well as accounting for how we wanted the fireplace to sit visually. 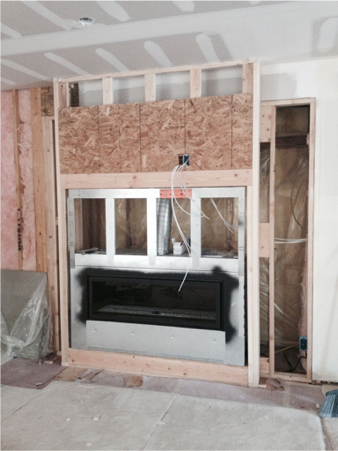 Here we installed a sheet of plywood above the fireplace that will be hidden behind the drywall making hanging a television in the future easier. 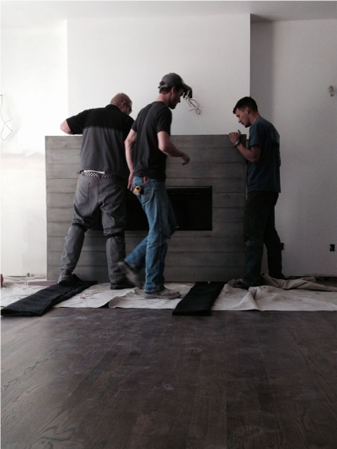 Once the fireplace was set we had a local company, Gray Rock Concrete come to make their templet for the surround. 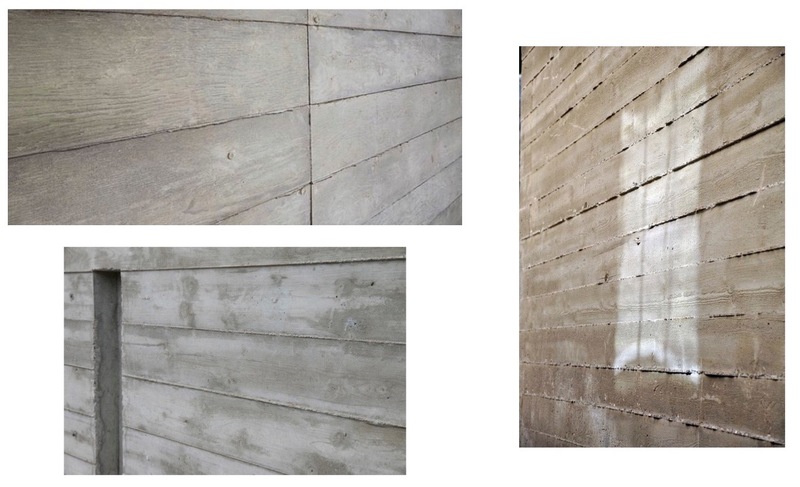 To find someone near you who can do board formed concrete you can contact a local contractor or you can look up a local concrete specialty company in your area. 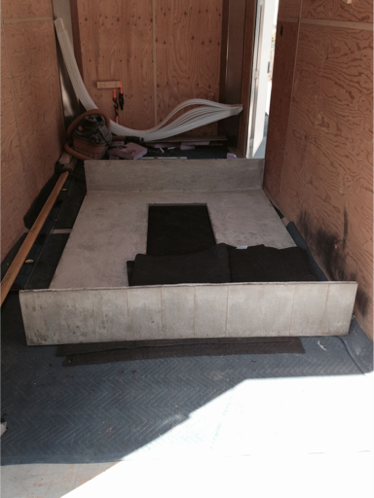 The day the surround arrived and was carried into place was an exciting day. It took 3 men to carry it in. Boy was it heavy! They did a great job and didn’t even scratch the freshly stained floors…added bonus. 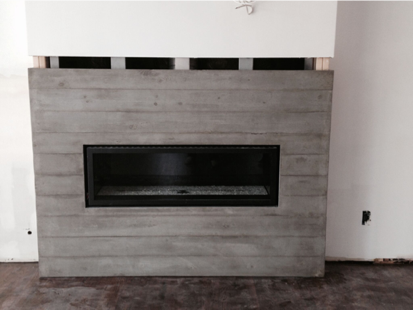 The concrete surround is not only practical and durable but it is beautiful as well. 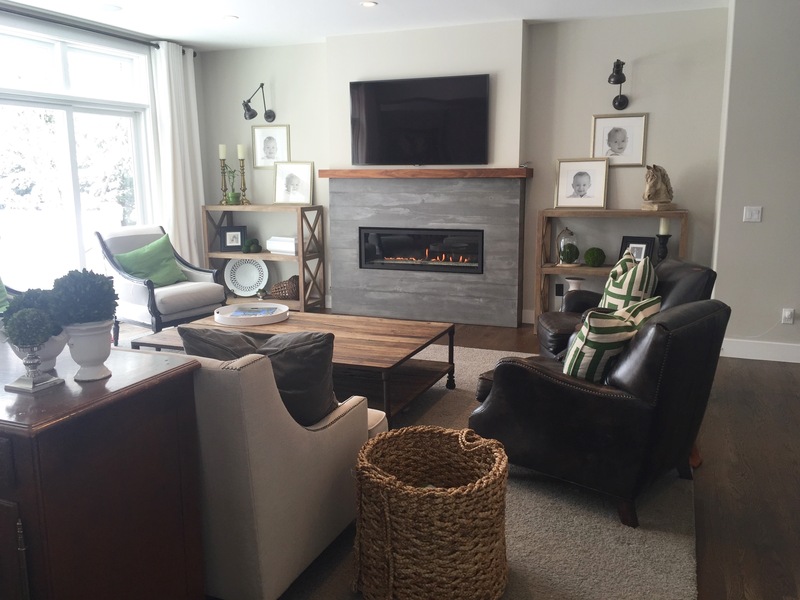 It adds a focal point to the room and a sense of modern and warmth. We think it is perfect. Very contemporary and beautiful. Can you tell me who made the mantel? Thank you. Thank you for the kind words. The mantel was milled from a slab of black walnut that I picked up in my travels. It turned out great I think! How did they get the concrete board formed and so thin? I’m looking to do this for my fireplace and just started researching. Very similar style. Looks great! This is stunning and just what I thought of last night for our place! It can be done!!! Can you please tell me if the concretise used any backing or form in the piece?